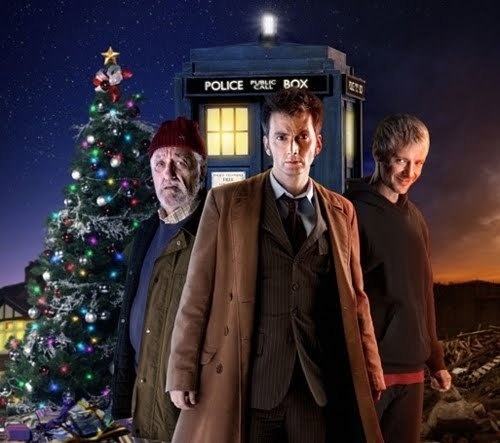 A Fairly Merry "Doctor Who" Christmas Podcast on "The Monthly Ten Podcast!" Last show of 2011! We have officially made it through one full year of podcasting. I started “The Monthly Ten” on January 10th of this year, and since then, we’ve recorded 19 podcasts. I hope you’ve enjoyed this journey as much as I have, and I look forward to more audio adventures next year! But for now, this is our last podcast of 2011, and it’s got a little something for everyone (as long as you’re a geek). Breaking our own formula, co-host Sean Chapman and I begin with an hour-long discussion of all the “Doctor Who” Christmas specials. This has been a tradition since 2005, but has it always worked? Find out our thoughts by listening! During the second hour, we switch topics to video games; between the two of us, Sean and I have played many of this fall’s major releases, and we give mini-reviews of Star Wars: The Old Republic, Halo Anniversary, Skyrim, Modern Warfare 3, Sonic Generations, and more. Remember to subscribe to the podcast on iTunes, and if you already have, it should automatically download on your ‘podcasts’ page when you open the program. If you haven’t subscribed yet, it’s easy, free, and can be done at any time! Or…. Click here to stream the show in your web browser! This was a great podcast to end what has been a very exciting year on, so for the last time in 2011….Enjoy the show!